A planned meeting of Trans-Pacific Partnership countries was unexpectedly delayed Friday after Prime Minister Justin Trudeau met with his Japanese counterpart at the Asia-Pacific Economic Cooperation summit in Vietnam. A planned meeting of Trans-Pacific Partnership countries was unexpectedly cancelled Friday after Prime Minister Justin Trudeau skipped the event when bilateral talks with his Japanese counterpart ended in disagreement. A spokesperson for the prime minister said there is simply no consensus between the 11 member countries at this time. "We made progress but, as we said coming in, there is no rush to conclude. There are outstanding issues for more than one country. One of those countries is Canada. We are working hard for Canadians and Canadian jobs in important industries such as automotive, agriculture, culture and intellectual property," the spokesperson said. National leaders were due to meet at the Asia-Pacific Economic Cooperation summit in Vietnam to hammer out the final details of a renegotiated trade pact, but plans were ditched at the last minute, a potentially ominous sign for the deal. Instead, Trudeau went ahead with a planned meeting with Sheryl Sandberg, the chief operating officer of Facebook, who is also at the summit. Liberal government officials refuted international reports — notably from Australian and New Zealand news outlets — that suggested Canada alone was to blame for delayed TPP talks. "I can't really speak for what you might be hearing from other countries," Foreign Affairs Minister Chrystia Freeland told reporters at the summit Friday. "Certainly, my own understanding, our understanding, is that there are a few countries who continue to have some important issues that they'd like to be addressed. And I think that's reasonable." Trade negotiations have now returned to the ministerial level with International Trade Minister François-Philippe Champagne currently in negotiations to resolve some sticking points. Trudeau has signalled all week, during his travels in Asia, that Canada is not ready to put pen to paper on the agreement as there are still a number of lingering concerns. 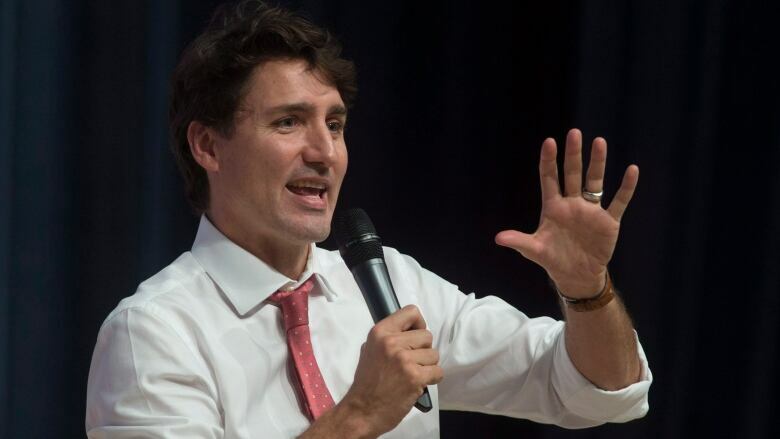 "Let me remind everyone Canada will not be rushed into a deal that is not in the best interest of Canada and Canadians," Trudeau said Wednesday. Trudeau met with Japanese Prime Minister Shinzo Abe, a key proponent of TPP, for some 50 minutes on the sidelines of APEC, nearly double the planned time. The men stood side by side and smiled for the cameras, but they only clasped hands after someone in the room said: "Shake hands, please." Freeland and Champagne, were also in the room with the two leaders, signalling some last-minute wrangling on trade between the two countries. Officials from Japan had said Thursday that countries had reached an "agreement in principle," but Champagne pushed back in a statement to Canadian media saying a final agreement was not yet in reach. Freeland said disagreements are not unexpected during tense trade talks. "When you have 11 parties at the table it is inevitable, during the heat of a negotiation, you will get mixed messaging. It should be no surprise to anyone that we are still negotiating. This is a very, very complex negotiation. Canada is going to take the time that we need." Canada is the second biggest economy, after Japan, among the TPP-11 nations. Despite reports, there is no agreement in principle on TPP. Japan is eager to pen a deal as it looks to check the hegemony of China in the Asia-Pacific region, especially as China's relationship with U.S. President Donald Trump improves after a successful state visit by the American leader to the communist country this week. Trudeau also met Friday with Mexican President Enrique Pena Nieto, to discuss the progress of another trade deal — a renegotiated NAFTA — and to strategize about their positioning on TPP. While some observers thought TPP was left for dead after U.S. President Donald Trump pulled his country out of the agreement in January, the other 11 original signatories have pressed ahead with talks to secure a pact that would eliminate tariffs on industrial and farm products across a bloc whose trade totalled $356.3 billion last year. While some countries had been hopeful for a deal by the weekend, Canada has consistently sought to tamp down such optimism. The prime minister has publicly said Canada will not be rushed into any deal, and will not cave to "pressure" from other countries. New Zealand's newly elected Labour prime minister, Jacinda Ardern, said early Friday talks were now "down to the wire," but there are still sticking points with some member countries. "I don't want to predict what way it will go. There are a number of issues still on the table. Not all of them are ours," she told reporters. New Zealand has concerns about investor-state dispute settlement provisions of the deal — a system through which investors can sue individual countries for alleged anti-competitive practices, a process often opposed by left-wing stakeholders. Canada has two major sticking points with TPP, including passages on intellectual property rights and cultural exemptions. Trudeau said Thursday Canada must maintain the right to regulate, and financially support, the country's cultural industries and not fear retribution at a trade tribunal. Importantly, Canada has long said it must be allowed to protect its culture — especially its minority francophone culture — against globalization and cultural assimilation. 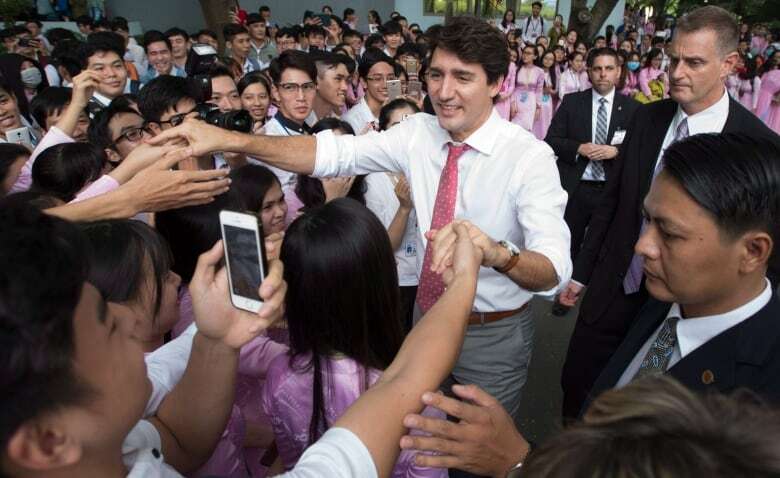 Trudeau ducked further questions about cultural policy at a moderated discussion in Saigon on Thursday, saying he is not at the negotiating table. Japan has previously opposed special treatment for culture during the initial TPP talks. Trudeau also met with former Ontario premier Bob Rae, who he recently appointed as his envoy to Myanmar, a country in the grips of a human rights crisis that has seen 600,000 Rohingya Muslims flee into neighbouring Bangladesh.